There is no luckier dog than one that is frolicking in the Colorado High Country. Whether skiing, snowshoeing, hiking, mountain biking, on the river, or on a lofty summit, dogs in the Colorado mountains are the happiest creatures on the planet. 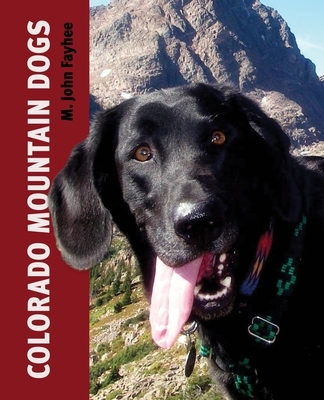 Colorado Mountain Dogs captures the joy and rapture of canines and their human companions as they frolic on trails, in camp and in creeks, from the San Juans to the Front Range, from Steamboat Springs along the Continental Divide to the Sawatch and Sangre de Cristos. Whether you are a visitor or a longtime resident, Colorado Mountain Dogs gives you a dog's-eye view of the backcountry, the ski slopes, and the resort towns of America's most-altitudinous state. With more than 150 photographs and sidebars on how to photograph dogs, reasons why people have dogs, and the naming of dogs. M. John Fayhee is the former editor of the Mountain Gazette. A one-time contributing editor at Backpacker magazine, Fayhee's work has also appeared in Forbes-Life Mountain-Time, High Country News, Aspen Sojourner Magazine, Outside, Sierra, Sports Illustrated, USA Today, Men's Fitness, New Mexico Magazine, America West Airlines Magazine, Horizon Air, and many other local, regional, and national magazines and newspapers. He is the author of many books, including Along the Colorado Trail, The Colorado Mountain Companion, and Bottoms Up. Fayhee has also hiked the Colorado Trail and the Colorado section of the Continental Divide Trail. A Colorado resident for twenty-four years, he lives in Silver City, New Mexico.